See my review of the first volume in this edition here. The Mahabharata is the more recent of India's two great epics, and by far the longer. First composed by the Maharishi Vyasa in verse, it has come down the centuries in the timeless oral tradition of guru and sishya, profoundly influencing the history, culture, and art of not only the Indian subcontinent but most of south-east Asia. At 100,000 couplets, it is seven times as long as the Iliad and the Odyssey combined: far and away the greatest recorded epic known to man. The Mahabharata is the very Book of Life: in its variety, majesty and, also, in its violence and tragedy. It has been said that nothing exists that cannot be found within the pages of this awesome legend. The epic describes a great war of some 5000 years ago, and the events that led to it. The war on Kurukshetra sees ten million warriors slain, brings the dwapara yuga to an end, and ushers in a new and sinister age: this present kali yuga, modern times. At the heart of the Mahabharata nestles the Bhagavad Gita, the Song of God. Senayor ubhayor madhye, between two teeming armies, Krishna expounds the eternal dharma to his warrior of light, Arjuna. At one level, all the restless action of the Mahabharata is a quest for the Gita and its sacred stillness. After the carnage, it is the Gita that survives, immortal lotus floating upon the dark waters of desolation: the final secret! With its magnificent cast of characters, human, demonic, and divine, and its riveting narrative, the Mahabharata continues to enchant readers and scholars the world over. This new rendering brings the epic to the contemporary reader in sparkling modern prose. It brings alive all the excitement, magic, and grandeur of the original - for our times. I'm home! I don't know if it's good or bad that I came home and was all stressed out about getting online and doing all my book reviews! I won't even get into how stressed I am about the stuff I am to do for BBAW :-) But first, the reviews... I didn't take any pictures myself in India, I'm sorry to say. That's mainly because I didn't do or see anything. I went to my cousin's wedding and then visited a lot of family. Fun, but not the stuff of scenic pictures to post on the Internet! I enjoyed the trip, but there is always so much hassle and hurry up and wait mentality in India (at least in Bangalore), which can get very, very frustrating. So I admit to being very happy to be home. Though every time I go to India, I am overwhelmed by the sense of hospitality from everyone there. No matter how small the home or meager the rations may be, everyone will always offer you a meal and a cup of coffee or tea, and welcome you so warmly. I love it. I think that sense of hospitality (segue, please!) is deeply rooted in India, judging from the Mahabharata I read while there. I personally don't think the war part of the Mahabharata is nearly as interesting as the lead-up. It's full of this warrior and that king, all their feuds and their devastatingly good aim, and somehow every single one of the kshatriyas fighting in the war is "unbeatable" by anyone. And yet... nearly all of them are beaten, somehow. So, really, volume 2 to me doesn't hold a candle to volume 1. It is, however, probably the more religious of the two texts, with long passages devoted to explaining the dharma of kings, right and wrong and the grey areas in between, and devotion to God. The parts that intrigued me most, however, were the footnotes. Menon relies heavily on a much longer translation done by Ganguli. Thus, there are several footnotes in the reading that say, "Ganguli's translation expounds on the war for 1,200 pages." WHAT?! 1,200 pages just on the WAR? And somehow Menon fit it into about 400? What exactly did he leave out? I feel he may have left out many irrelevant but highly amusing tidbits. This is mainly based on one footnote, in which Karna (the most ill-fated person ever to roam the Earth, probably) tells off his chariot driver, Shalya. In the Menon translation, he just says something to the effect of, "Shut up and drive." But then Menon says in the footnote that Karna goes on at length to insult Shalya and his people, the Madras, calling them loose and incestuous people with no honor. Well. Why in the world would someone leave out that whole section in a translation?! It makes Karna, to me, seem much more human (and wickedly delightful) than the more bland version included in the actual translation. How much of these characters and their actual personalities, then, have been sterilized through the ages? It makes me wonder, and it makes me sad, and it reminds me a great deal of Terry Pratchett's Small Gods. Hmm. 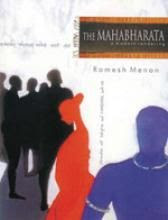 Whatever quibbles I may have on what is included and not included in Menon's translation, the Mahabharata remains a rolicking good story no matter your religion. I highly recommend the read, and I liked Menon's take on it. On a side note, I also picked up the GIGANTIC epic Mahabharata tv series in DVD format- so good!! I have been interested in reading the Mahabharata since I read a fictional book by Chitra Banerjee Divakaruni called The Palace of Illusions. The book is basically a fictional treatment of the most pertinent parts of the Mahabharata, and it was quite good, if you haven't already read it. I am going to see if I can grab a copy of the Mahabharata soon, but I will keep in mind that the first section is better than the last. Thanks for the great review, and glad you are back! Wonderful! Doordarshan version of Mahabharata is a gem of history! and I love their costumes! Thanks for visiting, Palz! I really appreciate your coming over from the GoodReads site- I know there are a ton of blogs on the list, so I am honored you came here. I have never read Mrityunjaya- actually, I've never heard of it. I will definitely look into it, though! It sounds right up my alley.